Here's an app that really showcases what the iPad is capable of, and how it can bring books to life to produce a totally new and captivating reading experience. The Elements is based on the best-selling book by Theodore Gray, Popular Science Magazine's Gray Matter columnist. It's a visual exploration of the periodic table of the elements. From the main table screen you can tap on any element to find out all about it. You'll see a smoothly rotating 3D example of an object made of that element. What's great is that you can use your finger to rotate it 360 degrees, or give it a spin and watch it gradually slow down. Any of the facts and figures alongside each element can be tapped to access the Wolfram Alpha computational knowledge engine for all sorts of scientific titbits of information, and the text from the book is also accessible on a separate page. 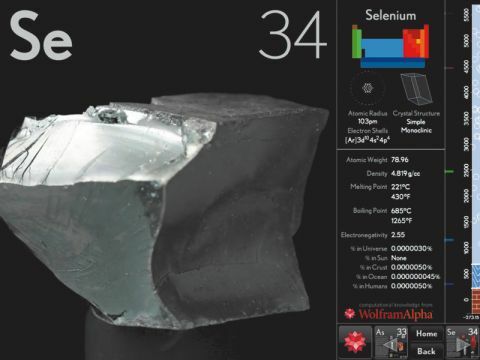 While the Wolfram Alpha data is frighteningly off-putting in its level of detail, the text of the book is actually very accessible and would suit a school-age reader learning about the periodic table of the elements for the first time, as well as an adult. You could argue that the app is a bit repetitive – each page for each element has the same basic structure – objects to rotate, or videos to watch and text to read, but when those pages look so lovely this seems a bit of a mean criticism. Eight pounds might seem like a lot for an iPad app, but if you compare it to the price of buying the hardback version of the book it's actually a huge bargain. If we'd had an iPad and The Elements at school, our chemistry grades would have been significantly higher. The only thing to look out for is that you get this localised UK edition from the store when you buy it, since the 'normal' version is in US English – both apps are exactly the same price.